1st SFAB HQs company after uncasing colors ceremony at Advisor Platform Lightning. TAAC South HA/DR Exercise. Members of Train, Advise, and Assist Command - South along with folks from Resolute Support hqs recently held a humanitarian assistance / disaster response exercise on March 18-19, 2018 in Kandahar. The two-day course consisted of scenarios involving floods, drought, earthquakes, and mass refugee crisis. The course was led by senior Afghan leaders and planners who recently graduated from the first NATO Operational Planner's Course. TAAC-SOUTH is comprised of members of the 40th Infantry Division of the California Army National Guard and the 2nd Infantry Brigade Combat Team of the 4th Infantry Division. (DVIDS, Mar 19, 2018). 'Big 5' For Advisors. The 1st Battalion, Royal Australian Regiment has identified lessons from mentoring the Philippines Armed Forces and compiled them into a paper. The authors hope that the many observations collected over months of training, will serve as an aid to anyone deploying, or currently deployed to, an advisor mission with foreign forces. Read Operating as an Australian Army Training Advisor 'Big 5' - The Philippines, The Cove, March 23, 2018. A Little Something about Gender Advisors. Deanne Gibbon - of the Australian Defence Forces - recently served in Afghanistan from August 2015 to May 2016 as NATO's Senior Gender Advisor. She writes about the role that gender advisors play within military organizations - especially when deployed in peacekeeping, humanitarian, or military operations. Read "WPS 2018: Navigating the operational gender agenda", The Strategist, March 23, 2018. Photo Story - Marines in Marjah District. RS HQs, DVIDS, March 9, 2018. 101st Abn Div to Head up USFOR-A. Major General Andrew Poppas, an Army officer with considerable Afghan experience, is once again heading to Afghanistan. This time he will be the U.S. Forces Afghanistan (USFOR-A) deputy commanding general for operations and the Resolute Support deputy chief of staff for operations. In the past the 101st was focused on the eastern region of the country (the old RC East hqs). With this 9-month long deployment the 101st will oversee NATO's train, advise, and assist mission nationwide. Read "101st Airborne Division Headquarters to case colors for Afghanistan deployment", Clarksville Now.com, March 22, 2018. A Grain of Salt Please. Army BG Michael Fenzel, the chief of plans (Director CJ-5) for the Resolute Support mission, is quoted in a DoD news release as saying "We are more capable as an advisory force than we've ever been before, and the Afghan fighting forces are more effective than they have ever been before." Things that make you say 'Hmmm'. Perhaps he missed the time frame of 2012-2014 when NATO and the U.S. had hundreds of advisor teams (SFAATs) deployed with MoI organizations from district center level up to MoI and MoD organizations from kandak level up to MoD. In RC East alone there were a couple of hundred advisor teams plus company and battalion combat formations conducting the 'partnership' mission. More effective now as an advisory force? I think not. We would have to provide advisor teams (or to use the new term - Combat Advisor Teams or CATs) to every district center and kandak as we had in the past. If the ANDSF is more effective than they have ever been before why does the Taliban control more territory than at any period in the conflict since the fall of 2001? Read more in "Officials Note Progress in Afghanistan, Difficulty for Taliban", by Jim Garamone, Defense Media Activity, March 20, 2018. DoD IG Report on CSTC-A Oversight. A new report by the Department of Defense Inspector General's office finds that there are systemic challenges associated with the Combined Security Transition Command - Afghanistan's (CSTC-A's) oversight of U.S. direct funding provided to the government of Afghanistan. It specifically finds that the Bilateral Financial Commitment Letters may not be the most effective method to manage and oversee the administering and expending of U.S. direct funding to the Afghan MoD and MoI. Of course, looking back over the past few years, these commitment letters were to be the management tool to ensure that the MoD and MoI would decrease corruption and implement reforms. Hmmmm. See "Summary Report on U.S. Direct Funding Provided to Afghanistan", DoD IG Report 2018-090, March 21, 2018. 1st SFAB Uncases Colors. The 1st Security Force Assistance Brigade HQs and its six battalions are now stood up in Afghanistan. The brigade hqs is co-located with the 203rd ANA Corps. Its six battalions are spread across Afghanistan. 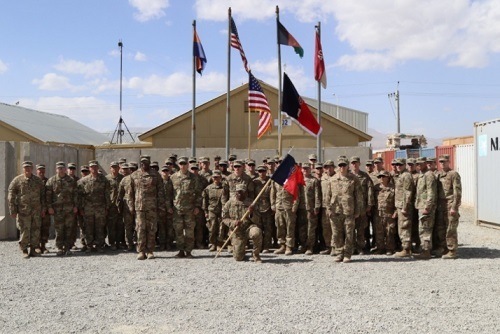 Read more in "1st SFAB uncases colors, begins partnership with ANDSF across Afghanistan. ", Resolute Support HQs, March 18, 2018. 1st SFAB at Camp Buehring, Kuwait. The advisory brigade, on its way to Afghanistan, stopped off in Kuwait. While they some of the brigade soldiers went through some pre-deployment training to include MRAP, SUAS, and CUAS. Read more in "1st SFAB Enters Theater", 1st Theater Sustainment Command, March 16, 2018. Gen Dunford to Meet with 1st SFAB. A recent DoD news release says that General Dunford traveled to Afghanistan to do an assessment of the situation. In addition, he wants to meet with soldiers of the 1st SFAB which has just deployed for a nine-month rotation to conduct a Security Force Assistance mission. See "Dunford Arrives in Afghanistan to Assess Campaign Plan", Department of Defense Media Activity, March 19, 2018. Dunford "Enthusiastic" about SFAB. General Dunford met with members of the 1st SFAB this past week and was encouraged by how the combat advisors are fusing the pillars of the ANDSF to work together in the conduct of combined operations. Read "Chairman Expresses Enthusiasm about Military Dimension in Afghanistan", Defense Media Activity, March 21, 2018. Assessment and Training for SFAB Soldiers. BG Mennes, director of force management (G-3/5/7) for the U.S. Army, provides info on the assessment, selection, and training of Soldiers for the Army's SFABs. (Army News Service, Mar 19, 2018). Read more about the 1st Security Force Assistance Brigade - SFAB. Read recent news reports about the 1st Security Force Assistance Brigade - SFAB. Read about the Army's newly established Military Advisor Training Academy (MATA).